Stock futures moved higher on Tuesday, Oct. 31, setting up for a recovery from losses a day earlier as U.S. central bankers convened for a policy meeting. Dow Jones Industrial Average futures were up 0.13%, S&P 500 futures added 0.16%, and Nasdaq futures increased 0.25%. Also on the economic calendar Tuesday: The employment cost index for the third quarter at 8:30 a.m. ET; the S&P Corelogic Case-Shiller home price index for August at 9 a.m.; the Chicago PMI for October at 9:45 a.m.; and consumer confidence for October at 10 a.m. In earnings on Tuesday, Pfizer Inc. (PFE - Get Report) rose more than 1% in premarket trading after beating third-quarter profit estimates. Earnings more than doubled to 47 cents a share from 22 cents a year earlier. Adjusted earnings of 67 cents a share beat estimates by 2 cents. Revenue of $13.17 billion was in line with estimates of $13.18 billion. For the full year, Pfizer expects revenue of $52.4 billion to $53.1 billion, up from $52 billion to $54 billion, and earnings of $2.58 to $2.62 a share, higher than previous estimates of $2.54 to $2.60. Aetna Inc. (AET also beat earnings over its recent quarter. Profit rose to $2.52 a share from $1.70 a share, while adjusted earnings of $2.45 a share beat consensus of $2.08. Revenue of $14.99 billion came in below estimates of $15.11 billion. For the full year, Aetna anticipates earnings of $5.95 a share, higher than previous targets of $5.46 to $5.56. The healthcare company anticipates adjusted profit of $9.75 a share, higher than a previous estimate of $9.45 to $9.55. Under Armour Inc. (UA - Get Report) tanked 13% in premarket trading after a drop in quarterly profit and sales. Earnings declined by 58% to $54.2 million and fell short of an analyst target of $84 million. Sales dropped 4.5% to $1.41 billion, falling short of $1.48 billion consensus. CEO Kevin Plank said the company is "working aggressively" to execute its strategy "against this difficult backdrop." 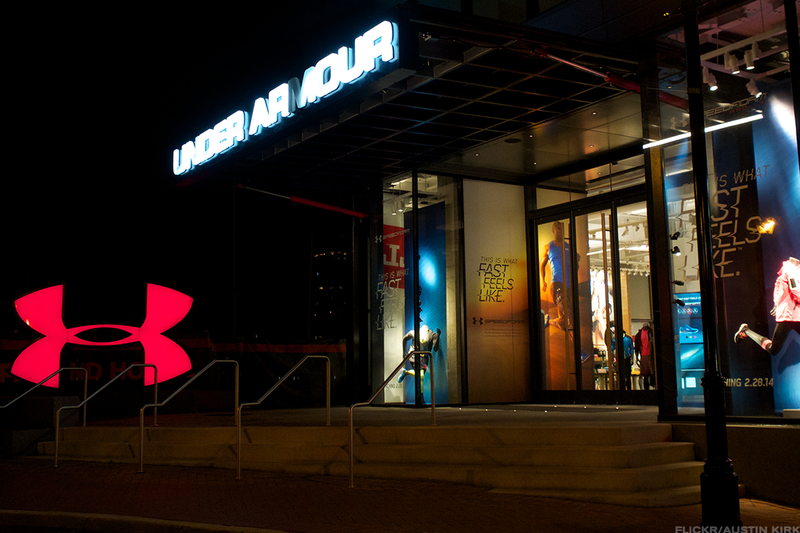 Under Armour Nosedives - Can It Save Itself? Kellogg Co. (K - Get Report) topped third-quarter earnings and revenue estimates. Profit rose to 85 cents a share from 82 cents a year earlier. Adjusted earnings of $1.05 a share beat consensus by 11 cents. Revenue of $3.27 billion exceeded expectations of $3.21. Other earnings to watch include Mondelez International Inc. (MDLZ - Get Report) , XO Group Inc. (XOXO , Mosaic Co. (MOS - Get Report) , Lumber Liquidators Holdings Inc. (LL , Mastercard Inc. (MA - Get Report) , Arch Coal Inc. (ARCH - Get Report) , and AK Steel Holding Corp. (AKS - Get Report) . Qualcomm Inc. (QCOM - Get Report) shares were sharply lower Tuesday amid reports that Apple Inc. (AAPL - Get Report) may dump the chip supplier from its iPhone and iPad line up next year. Multiple media reports, first published by the Wall Street Journal late Monday, suggest Apple is already designing its key tech gadgets without Qualcomm chips as the two groups continue to spar over royalty payments. Bloomberg reported that Apple may favor Intel Inc. (INTL - Get Report) or MediaTek Inc (MDTKF components as a replacement. Updated from 7:52 a.m. ET, Oct. 31.